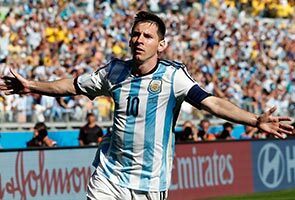 BELO HORIZONTE: A stunning injury time strike from Lionel Messi spared Argentina's blushes as they qualified for the last 16 of the World Cup with a hard fought 1-0 win over Iran in Belo Horizonte. However, despite enjoying the vast majority of possession in the first-half, La Albiceleste struggled to create chances from open play against a well-organised Iranian defence. Instead it was Argentina who snatched victory at the last as Messi created the half yard of space he needed on the edge of the area before leaving Haghighi with no chance as he curled the ball just inside the far corner on his favoured left foot.